Sunday retail business management advice: 16 ways retailers can reduce employee theft | A blog about smart POS software for independent small businesses. For everyday items, items most people will use or could convert to cash, use stock control. Enter new stock as it comes in, scan all sales and only reorder based on what you software says. Every month do a stock take. Take cigarettes – Tobacco stock discrepancies are an indicator of theft. Had one newsagent been doing this they would have caught their $250 a day employee theft months earlier. Scan everything you sell. Do not use department keys as this makes it easier for employees to steal since they know there is no trackback to stock on hand. Using department keys is an invitation to steal. Do your end of shift through your software and have a zero-tolerance policy on being over or under. Reconcile banking to your computer software end of shift. One newsagency where this was not done was being skimmed regularly for $200 a day. Do spot cash balancing. Unexpected checks can uncover surprises. One newsagent needing to do a banking during the day uncovered a $350 discrepancy that lead to discovery of systematic theft. Change your roster. Sometimes people work together to steal. One newsagent found a family friend senior and their teenage daughter stealing consistently. Check your Audit Log. Look at cancelled sales, deleted sales and items deleted from a sale. Leaving a cash drawer open from the previous sale, scanning items, taking the cash and cancelling the sale is the most common process used by employees to accrue cash they then take from you. Good software tracks cancelled sales and what was in them. This can be matched with video footage. Check GP by department. If GP is falling outside what you expect, research it further. Setup a theft policy. 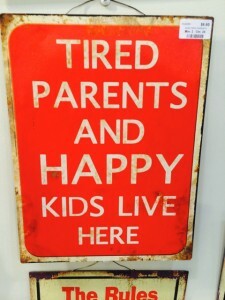 Put this on a noticeboard in the back room. Get staff to read it and sign up to it. See the last page of this advice. Keep the counter clean. A better organised counter reduces the opportunity for theft as it makes detection easier. Have a no employee bags at the counter policy. This makes it harder for them to hide your cash. Beware employees who carry folded paper or small notepads. These can be used for them to keep track of how much cash is in the register that is theirs – i.e. not rung up in the software. Beware of calculators with memories at the counter. One newsagency employee used the memory function to track how much cash had to be stolen prior to balancing for the day – cash from sales not rung up. Do not let employees sell to themselves. If they want to purchase something make them purchase it from the other side of the counter. Be professional in your management of the business. The more professional your approach they less likely your employees will steal as they will see the risk of being caught as high. Advise all job applicants that you will require their permission for a police check. From the outset this indicates that you take your business seriously. In many situations applicants who have been asked for permission to do a police check advise they have found a job elsewhere. Do not take cash out for your own use in front of employees. If they see you take cash for a coffee or lunch some will see this as an invitation. 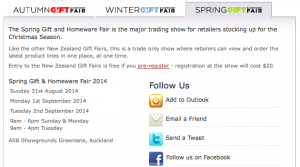 Tower Systems is thrilled to be showing off its latest POS software for gift shops at the Spring Gift Fair in Auckland starting from tomorrow. As the only POS software company at the fair we will embrace helping gift and homewares retailers to make the most of smart Point of Sale software in their business. We will be showing new POS software for gift and homewares retailers, software is is being released in the next couple of weeks, software that delivers new facilities based on the latest international retail trends for small and independent retailers. 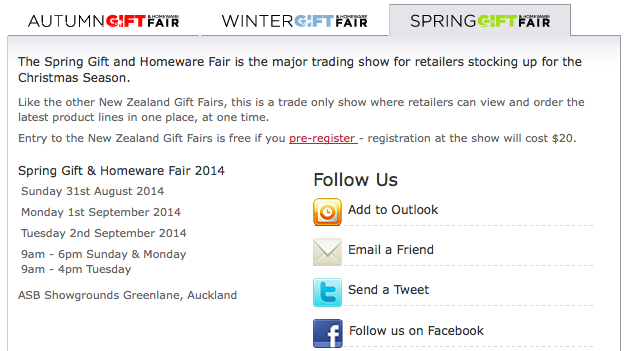 If you are at this terrific Auckland gift fair event, be sure to stop by our stand and say hi. The latest POS software for jewellers from Tower Systems has new facilities to help jewellers and their employees to more successfully sell product. By enabling transactions on the shop floor, there is no need to pull shoppers to a counter. These new facilities make it easier to transact with the customer where there are in-store, thereby enhancing the shopping experience. 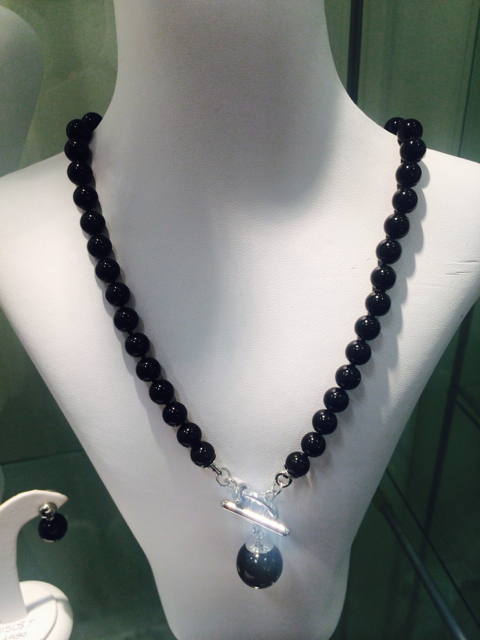 Jewellers are loving the enhancements. These portable facilities coupled with customer service tools, loyalty services and product care information served on receipts enable small and independent jewellery businesses to offer more unique, tailored and memorable shopping experiences. Tower Systems has commenced work on several new initiatives to help better align the businesses of newsagents and newspaper publishers. Two projects are under way with a third expected to commence soon. With close to 1,900 newsagents in the Tower newsagent community we have the critical mass and geographic concentration publishers are looking for in regional and other targeted campaigns. There are some exciting initiatives coming to help newsagents grow this side of their business. The Tower Systems homewares software helps homewares business owners understand and enjoy their business more. From better stock management to flexible shopper loyalty engagement to staff tracking and motivation, the Tower software helps homewares create more valuable and efficient businesses. The focus at Tower Systems is on small and independent retailers, local high street and regional and rural businesses where retailers are able to make their mark by offering unique products backed by excellent customer service – as facilitated by our software. Our help for homewares retailers is enhanced by some excellent supplier relationships. Tower Systems has tested and loaded a new stock file for Uniball Pens. It’s available now from our website. A group from our Tower Systems head office had a terrific morning Tuesday this week meeting with users of our POS software in Launceston, talking about the next software update, sharing training and covering some business management opportunities in the software. 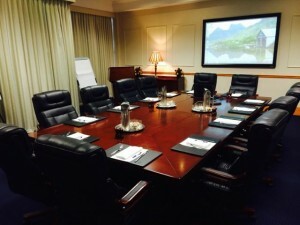 We were fortunate to be located in the warm and beautifully-appointed boardroom of the Clarion Hotel, a luxury heritage hotel in downtown Launceston. The meeting started with a fully catered breakfast of scrambled eggs, mushrooms, bacon and muffins plus fruit, juice, coffee and tea. The 7am start on a cold Tassie morning makes a hearty breakfast important. Participation in the meeting was free to Tower Systems customers. 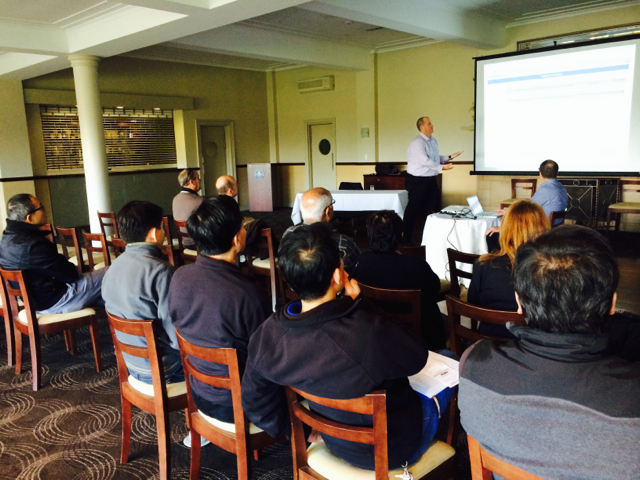 The Launceston meeting is the latest in a series by the company putting its leadership team in front of customers. Tower Systems has been hosting POS software user meetings around Australia over the last three weeks. 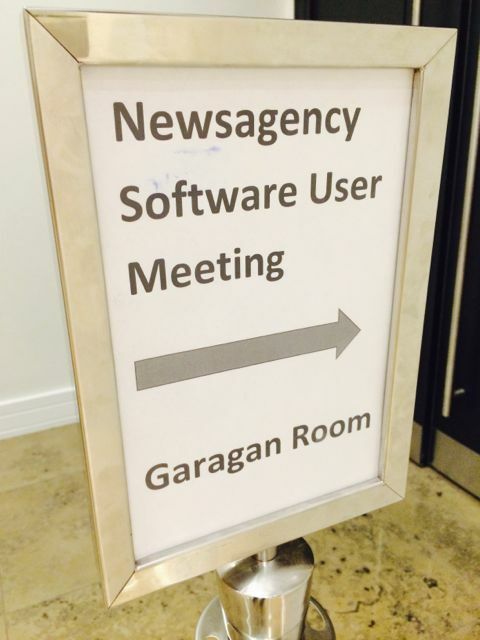 Years ago software companies used to run user meetings regularly. Today, few companies offer them. They are a point of difference for us. We find the sessions are excellent for two-way discussion. We learn as much from our customers as they learn from what we share. It’s terrific. This latest round of user meetings has offered training on the software, answered many questions and shared business building advice that will help our customers make more money in their businesses. Access to the sessions has been free and it includes a tasty breakfast to keep them fuelled. Receipts say a lot about a business from professionalism to confidence to customr focus. 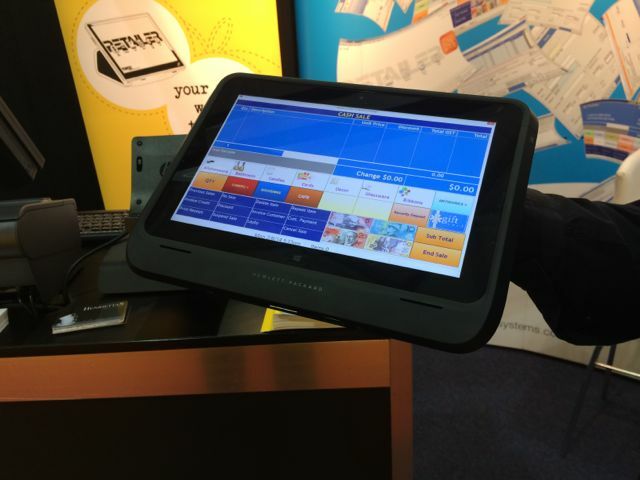 retailers using the Point of Sale software from Tower Systems have plenty of options through which they can customise receipts to better promote their business and serve customers. Besides accurately recording details of a purchase transaction, retailers use the Tower receipts to drive shopper engagement with activities like their business Facebook page, enter competitions and provide useful product information. 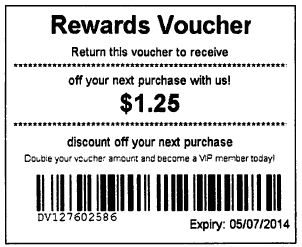 Retailers also use the Tower software produced receipts to indicate cash available as a discount on a future purpose – in the example shown this is called a discount voucher although our retail partners can call it what they like. Key to all this is that the receipt follows a clean design and is easy to use – with good use of font size and attributes such as bold to draw attention to key call-outs. Giving retailers flexibility in receipt style and design is a marker of flexible POS software. A good receipt will drive shopper engagement for a retail business. The latest version of our POS software takes receipt options and opportunities to a new level for our retail partners. The Tower software supports many receipt variations. Retailers are loving the shop floor portable POS software solution Tower Systems offers. Retailers are loving that we have a new way of helping them grow their business. Thanks to refreshed POS software, new wireless portable POS hardware and excellent support from our team we are helping more retailers to bring selling from behind the sales counter and deeper into the business. From a garden centre employee selling out among the trees to jeweller customer adviser standing with a customer at a display case away from the counter, we bring smart technology to retailers where they need it. We help retailers sell more effectively. This smart shop floor technology solution is a next-generation solution fit for all types of retailers, especially the independent retailers we serve here at Tower Systems. Business owners often call on politicians to remove red tape and make doing business easier. Some small retail business owners including small business retailers create red tape of their own, red tape that makes it harder for customers to do business with the business and red tape that makes it harder for our employees to serve our business. 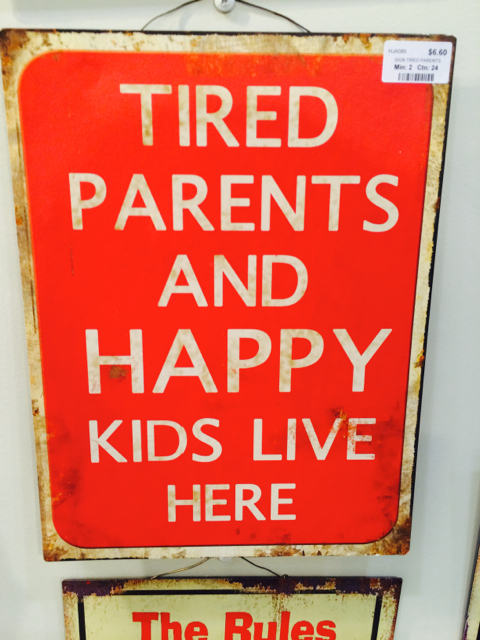 negative signs like this is not a library or no this or that in store. Credit card processing fees on lines where you can cover yourself in your pricing. A shop layout that discourages shopping. Slow sales processes at the counter. Poor back office processes with customer accounts. Mixed messages in signs in-store leaving shoppers unsure about offers. What red tape, what barriers could you remove from your retail business thereby making doing business with you easier? 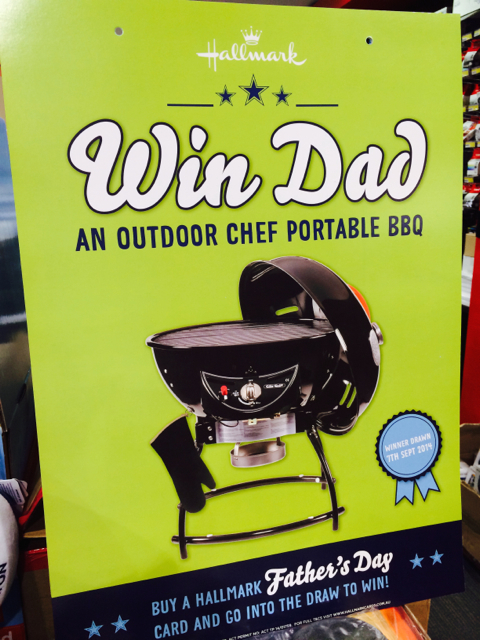 Thanks to receipt options and other facilities in our POS software, retailers can help drive shopper engagement in competitions – such as the Hallmark cards competition offering the opportunity to win a $500 BBQ in participating stores that’s running at the moment. Retailers can promote competitions like this on their receipts. They can also promote it on customer displays. This type of promotion is free. It is excellent use of existing retail management infrastructure – manages by our POS software as directed by our retailers. 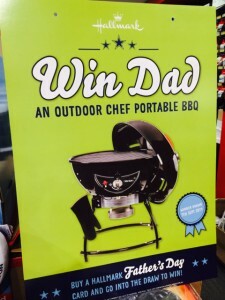 Connecting shoppers on receipts and at other touch points with in-store promotions such as the BBQ prize adds value to the in-store promotion and drives the likelihood of shopper engagement in the promotion. Smart use of our smart POS software drives better outcomes for our retail partners. Our help desk enjoys helping retailers to leverage these opportunities. Dead stock in a retail business is dead money. Tower Systems helps its POS software users to identify dead stock with excellent reporting tools, understandable business advice and practical help. Thanks to smart reporting, a retailer using our software can quickly see items which have not sold in a selected period of time. This list can then become a focus of business activity with a view to either returning the stock or acting on it in some other way on the shop floor to turn the stock into cash. Moving old or dead stock starts with understanding. Our POS software makes accessing this understanding easy. We back this with helpful advice from a small business retailer perspective. This is where our help desk is different what is usual for a software company like us. It’s more practical and outcome focussed. Moving stock in a timely manner is crucial for all retail businesses. We are proud of the stock management and movement tools we provide access to through our software and the support we provide those using these tools. We have published new advice on our knowledge base on how to use discount vouchers to drive shopper engagement in your retail business. This advice is from a business management perspective – beyond the usual advice you might see from a POS software company. We have developed the advice from our experience using the discount vouchers in our own retail business. This latest advice will help more retailers make more money. We like that. 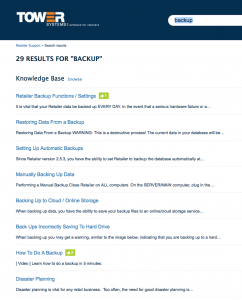 Our rich content POS software knowledge base is full of advice and assistance for retailers using our Point of Sale software on how to do safe and fast backups of business data. This advice includes information on off site backups for speed and security in any size and scale of business. 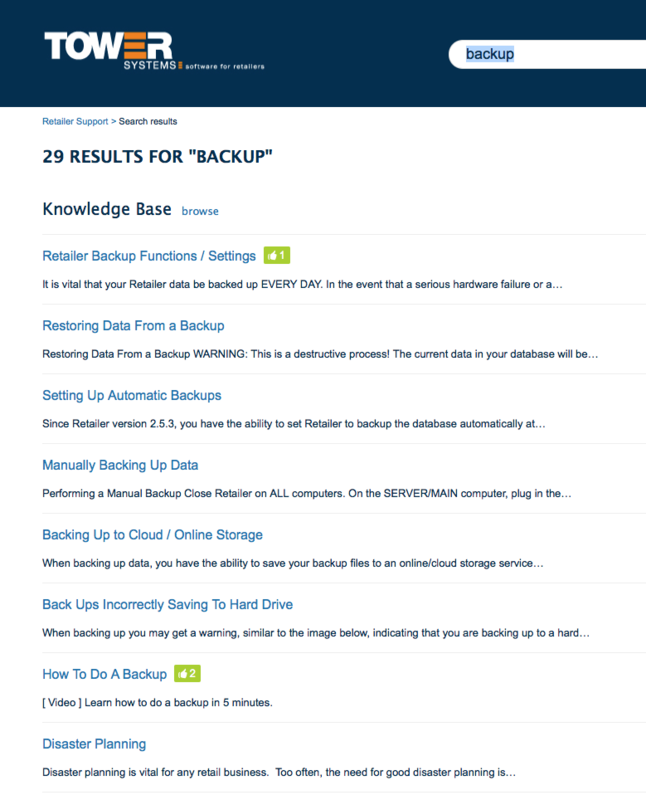 The image shows some of the backup specific content on our knowledge base that can be searched by our customers. This rich resource is in addition to live help desk support available to our users as well. Offering access to a range of backup options including cloud based services retailers partnering with us have choice available to them. 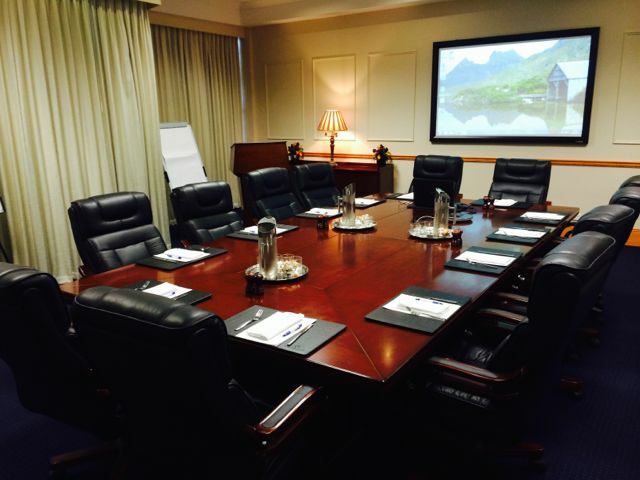 We have a team in Brisbane at the River View Hotel for our Brisbane newsagency software user meeting today. This looks set to be a terrific session where we will cover what’s in our next major newsagency software update as well as providing training on some excellent business-building facilities recently released in our software. We help newsagents grow stronger and healthier businesses. Firearms retailers can rely on our Firearms retail software to continually improve to better serve their businesses. 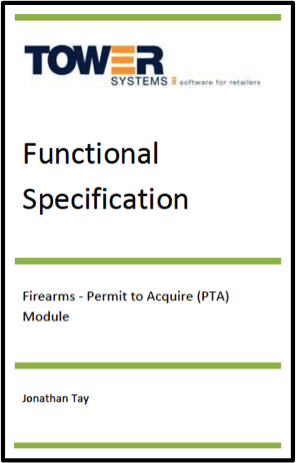 Thanks to advice from several firearms retailers and state based regulators we are creating a new firearm permit to acquire (PTA) tracking facility. 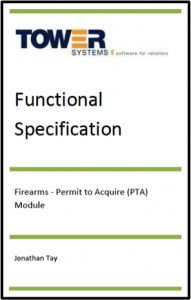 Firearms retailers and their staff have directly guided this software development project. Coupled with our advanced serial number tracking tools, you will be able to track a specific firearm back to a permit. Where regulators permit, our software will create a file you can upload to meet regulatory reporting requirements. We are ensuring that through this software we help you meet all published regulatory standards in anywhere in Australia. As the owner of Tower Systems I stand behind our software. We will continually improve our firearms retail software to ensure it serves your needs well into the future. NSW/ACT/TAS: Nathan Morrison – 0417 568 148. VIC: Mike Hill – 0423 848 482. SA/WA: Tim Batt – 0401 833 917. QLD/NT: Paul Slater 0434 365 789..
We are thrilled with the surge in interest in the last week following the release of details of our long-term partnership project with PayPal. Thanks to this innovation, our retail partners have options not available with some other POS software companies. This provides them and us with a commercial advantage now. The support of PayPal through this project has been terrific. Tower Systems has developed software specifically for Australian adult shops. We use the adult shop software in our own adult shop – as do many other adult businesses. Using this software you will get customers spending more and you will bring customers back to purchase more. We have built into the software a safe, secure and adult shop customer friendly loyalty facility that does not require any sign up or record keeping – just they way adult shop customers love it. We use the loyalty facilities ourselves to increase average customer spend and thereby get more value from each visit. We also use the software to track everything we sell, manage staff, track staff performance, reduce employee and customer theft, manage GST collected and feed sales data through to our accounting software. Our adult shop is in north Queensland and I’m in Melbourne. Having software that makes off-site management easier is important to me – as it’s important to many adult shop owners who cannot be in their business all the hours they are open. Retail is tough. Small business retail is tougher. Too often, challenges encountered by small business retailers are of their own doing. Like personal health, our choices impact our situation. Here is some of our best practice advice for a healthy and prosperous retail business from the perspective of a POS software company. Enter into your computer system all stock you receive and all stock you return to suppliers. Use your software to create orders for replenishment stock. Balance your registers every day using your software. Do spot stock takes for popular items to check for theft. Measure performance by department, category and supplier. Do more of what works and less of what does not work. Compare your performance this year to last year. Fix what is not working. Use your software as your eyes and ears. Good POS software has excellent back end reportage to let you see how your staff use the software. Train your staff to be fit for purpose in using the software. Focus on many small steps towards success rather than one big step. We see many retail businesses prospering through smart engagement with the facilities in our POS software. Pet retailers love our pet shop software not only for its facilities but also for our supplier support and engagement. Our work with Masterpet, Kongs, Pet Pacific, Dr Neil’s and Pet Premier means pet retailers are able to more easily load stock files and invoices, saving considerable time. In addition to our supplier work, we also provide access to facilities pet retailers love and through which they can better serve their customers. These are reasons more pet shops are switching to our pet shop software. 2014 has already been an excellent year with more pet retailers joining our user community. 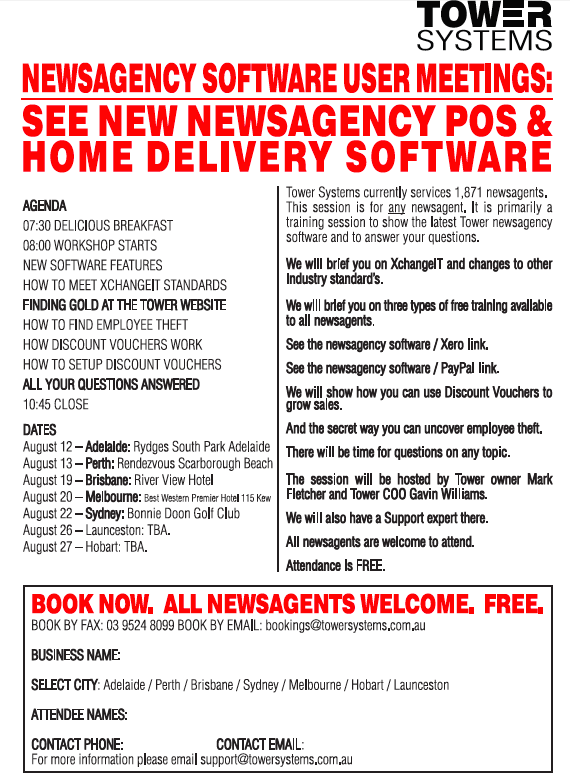 The national capital city newsagent user meeting tour commenced by Tower Systems this week is proving to be successful at attracting interest amend Tower retail partners thanks to the free training and business insights provided at the events. While travelling on the national roadshow, Tower is making its leadership team available to other users for one on one discussions and assistance as the company demonstrates its commitment to meet with customers. Access to the user meetings is open to any newsagent. It’s free, breakfast included. 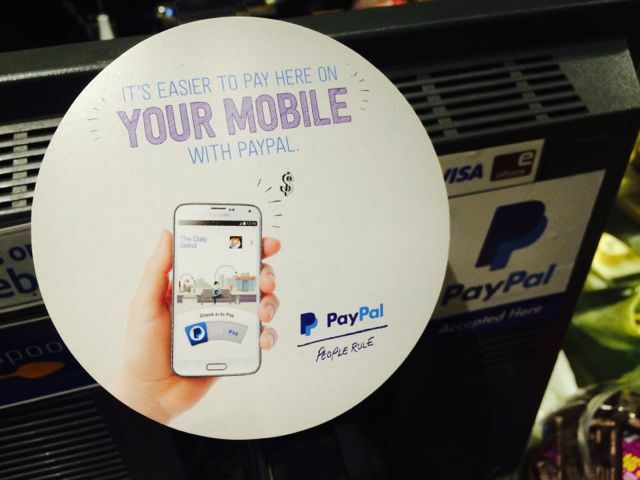 PayPal is helps partner retailers to promote PayPal as a payment option in-store with collateral and other promotional material and help to drive shopper engagement. Their in-store commitment is another way of helping retail partners to drive business through using PayPal itself as a means of reaching out to new prospective customers. 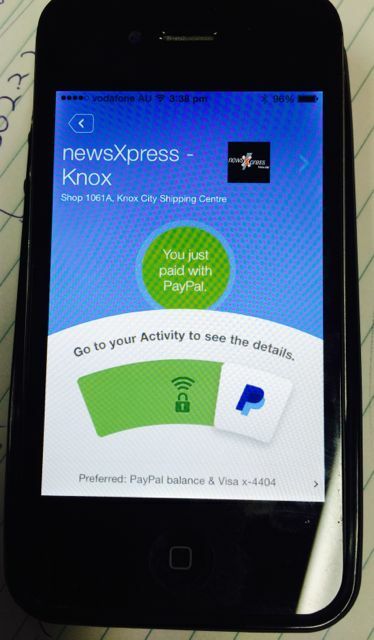 Our integration with PayPal is at for forefront of integration technology. In our marketplaces we are first to market – driving good business outcomes. Paying via PayPal for anything in a store using our smart POS software is easy. 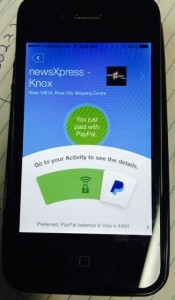 Via the app and our smart integration the retailer will already know about a customer with a PayPal enabled device just as the customer will know about retailers nearby offering the Paypal payment option. When it comes to paying at the counter, it’s as fast as using a credit card. And certain too with excellent details provided for transparency to the customer. Refunds are a breeze too. The integration between the Tower Point of sale software and PayPal is leading edge for us, our software and our retail partners. We are grateful to PayPal for their support and faith in us. 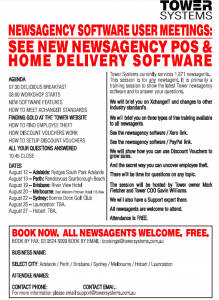 Today in Perth we completed the second stop in a national tour offering live newsagency POS software user meetings – delivering free training, business insights and other help to guide newsagents make more from their technology investment. With 241 newsagent customers in Western Australia we made sure a stop in Perth was on our agenda. In addition to the meeting we got to engage in one on one catch up with customers to discuss business specific situations. From what we can see we are the only newsagency software company delivering these benefits.